I might have more to say about this later, but for now I just want to highlight the idiocy of some on the right of the spectrum here in Canada. Yesterday, when the news broke about the tragedy in Norway, the response by many in the Twitterverse, blogosphere and in the comments sections of news articles was overwhelmingly vitriolic against Muslims. And this judgement was made despite the fact that there was no evidence that an Islamic group was involved. None. And the worst of the lot on Twitter were the usual right-wing morons who always like to spout hate. If you follow Twitter, you know who they are. But this morning, where have all the anti-Islam Tweets gone? Now that details are leaking out, it looks like the Oslo terror may have been the work of a Christian fundamentalist or someone on the far right. So now I assume we’ll see lotsa anti-Christian Tweets, right? 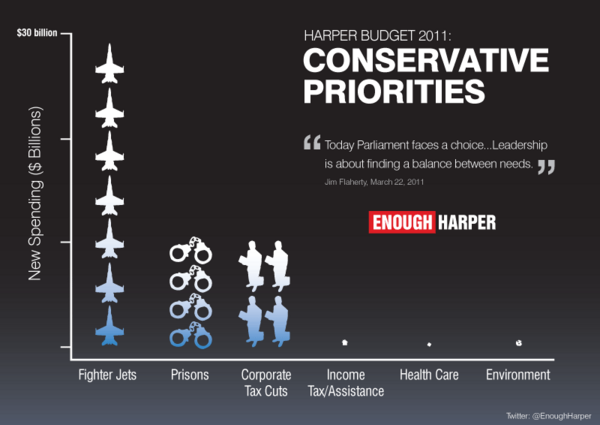 Prisons, corporate tax cuts and aeroplanes – in a bar graph! Hats off to Kris Stewart. Agree with the slant or not, it is nice to see some creativity out there! Feschuk is a pretty funny guy. Authors have devoted entire books to trying to decipher and understand Stephen Harper. But is he really that complex? I’d say his pattern of behaviour over recent years has given Canadians a rather clear sense of who he is. He’s the only leader of a G8 country who also happens to be a seven-year-old boy. A seven-year-old cannot tolerate being wrong, so he goes to any lengths to explain things away.So does Harper. Consider his reaction when the Federal Court of Appeal ruled the Conservatives had violated our election laws with their “in-and-out” financing racket. He then downplayed the ruling, claiming there have been “different court decisions on this particular matter.” That’s an interesting take on how our justice system works. Last I checked, court is not a best-of-five thing. You cannot, for instance, lose at the Supreme Court and still claim to have squeaked out a thrilling three-to-two court victory. I’ll be keeping that pic for posterity! Related to yesterday’s post. Nice one Mr. Gable! The Harperite social conservatives are crowing with glee over the Con’s refusal to recognize that access to inexpensive and safe abortions are key factors in maternal health. And so is the American anti-choice lobby. “Under President Bush, we had the Mexico City policy, which prohibited exporting abortion. As you know, with President (Barack) Obama, he repealed that policy,” Janet Morana, founder of a pro-life group called Silent No More, told reporters in Ottawa on Thursday morning. Stevo must be grinning from ear to ear with the news that the U.S. christian fundamentalists are in his corner! Despite this, support for the DeceptiCons is staying rather stable according to the new EKOS poll. What I can’t figger is WHO THE HELL ARE THESE PEEPS??? I mean, who are those idiots are are saying to the pollsters that they would actually VOTE for Harper or one of his robot minions! I just don’t “get” that! In other news, Cons are saying that the big bad ol’ MotherCorp is waging what they call a “faith war” against the ReformCons. In a memo to supporters, the backroom operatives note that this is just the next step in the CBC’s “ongoing campaign against the Conservative Party.” At issue is a story about the rise of the right-wing religious groups and their connections to the Stephen Harper’s government that ran on The National last night. The piece – which, as Tories armed with stopwatches note, ran “a full eight minutes in length” – was inspired by the release of a new book, The Armageddon Factor by journalist Marci McDonald, in which she investigates the right-wing religious movement in Canada and its ties to Stephen Harper and his government. *Snicker* – “backroom operatives” I love that term. I wonder what they look like? Anyhow, isn’t the CBC just stating the painfully obvious? Of course the Reformatories are in bed with the religious right! Fundamentalists believe that an old guy with a beard lives in the clouds – ready to judge and smite all of we infidels! 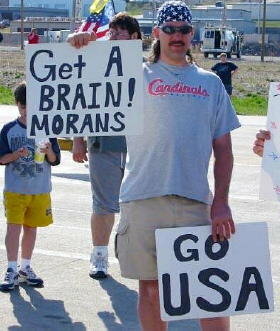 And really, does anyone with an IQ over 100 think that most of the Con caucus has the elementary intelligence to understand that believing in such things is about as legitimate as believing in leprechauns? Stop the anti-CBC rants, Cons… outside of your wacko base of support in the west, you’re not going to gain much support because, well, most folks LIKE the CBC! …kept in the dark and fed crap. According to the Budget watchdog Kevin Page, the ReformCons are not providing non-Con MPs with enough information with which make informed decisions. When it is finally released, budget watchdog Kevin Page’s costing of one of the Conservative crime bills will suffer the same problem as his probes into First Nations schools and the war in Afghanistan — no hard data from the government. MPs too can’t get data on stimulus spending, the impact of departmental freezes or the financial impact of legislation and other things. This is not new to the Cons, but they have made a bad situation even worse with their religious fervour for secrecy and the centralization of decision making. My Canada does NOT equal the CPC, Mr. Harper! 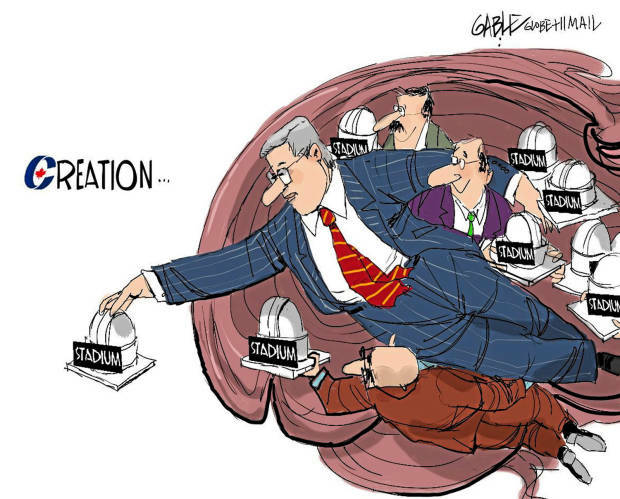 Again, who is really surprised to see that the Harperites are trying to brand “stimulus” funding as a CPC initiative by emblazoning that ugly “C” on some of those big novelty cheques when making new pork-barrel announcements. Clearly against ethics legislation, the ReformCons are once again doing exactly what they vowed not to do in the last campaign. The PMO quickly said that the MP in question, Gerald Keddy, was out of line in photoshopping out the Canada logo and replacing it with the CPC brand. David Johnson, a professor of political science at Cape Breton University, said no one disputes that government politicians can gain visibility by distributing funding in their ridings. But he believes Mr. Keddy crossed a major line. “It is a crass and manipulative use of public money for partisan advantage,” he said. Yeah, yeah, yeah, I know the Libs have done similar things in the past, but at least THEY didn’t make the elimination of these manipulations a part of their election platform and THEN cynically turn around and do exactly what they campaigned against! Rebranding Canada and the Canadian Government as the Reformed Conservative government of Harper is not OK. Canada does not equal Stevo’s ReformCons… and it never will (except for the rednecks out west). Constant campaigning via unethical behavior and partisan tricks is the best the Harper party have to offer Canada. And the polls are showing it. No growth despite an ill-defined opposition. This as good as it gets for the Harperites. They are so arrogant they don’t even think of being subtle. Of course, that has never been Harper’s way, has it? The Harper government thinks Canadians are so stupid we won’t see through them. But they are so transparent with their lies and tricks we can’t help but do just that. I have more or less given up on Alberta and Saskatchewan, but for the rest of you – wake up! Stephen Harper has tried to portray an image of being a middle-of-the-road Conservative who does not pay fealty to the far right wing elements of his party. Knowing that a majority government hinges on his not being seen as a PM who would lead Canada too far to the right, his policies, speeches, ads, etc. have all been pushing the Mr. Nice Guy image. He has also carefully steered away from talking about a majority. The last time he did that, potential voters were spooked and flocked to the Grits. And man, is he careful about centralized messaging. NOTHING gets out to the media without his approval – until now. In a speech to the party lapdogs in Sault Ste. Marie last week that was closed to the public and the media, Stevo’s blah-blah speech was taped by an audience attendee. Whoa! But this is not at all surprising. Those of us who have followed Harper’s moves through the years have known that his mask of moderatism was just that; a façade.